The Green Room is decorated in shades of pale green and rich gold, which successfully complements the selection of antique furniture within. Overlooking the garden, the room sleeps two in a king sized bed, which can be split into two singles if required. There is a dedicated en-suite bathroom. For more photos of the Green Room see the Galleries page. Bedrooms are large, light and airy; recently decorated and carpeted throughout, with a variety of period furniture and king sized beds. 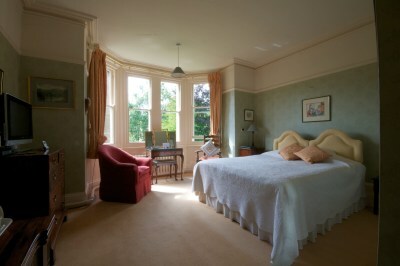 Each room boasts a large four window bay overlooking attractive gardens and hilly countryside beyond. Bathrooms are spacious and decorated from floor to ceiling with traditional Victorian style tiles; baths are long and deep; showers produce an excellent head of water; all towel rails are heated. A full range of toiletries is provided, including bath hats, tissues and cotton wool balls. Rooms are equipped with colour T.V., alarm clocks, hair dryers and tea tray plus home made cookies. Spare bedding is available if required.